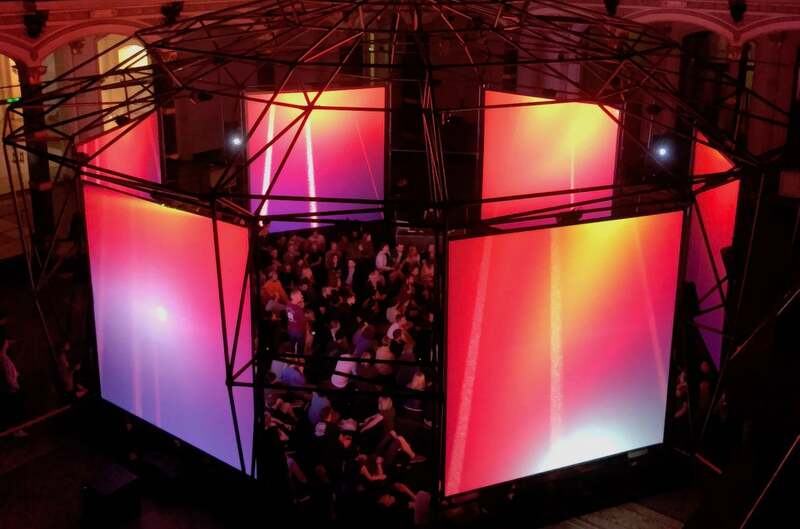 The ISM Hexadome comprises six large rear-projection screens for advanced laser projectors, arranged in a hexagonal structure. Standing nearly eight meters high and spanning 15.5 meters wide, this metal skeleton also hosts a 52-channel Klangdom sound system developed by the ZKM Center for Art and Media. Arranged in a dome configuration, the speakers provide a fully spatialized sound experience. Klangdom is controlled by the ZKM’s software Zirkonium, which artists learn to operate during a three-week residency at the Institute for Music and Acoustics in the southwestern German city of Karlsruhe. The Hexadome can be used for both audio-visual installations and live performances. The Institute for Sound and Music plans to make the structure part of its permanent collection in a museum in Berlin dedicated to sound, immersive arts and electronic music culture. The ISM Hexadome is a celebration of artistic collaboration. Created by the Berlin Institute For Sound & Music, the immersive 360° audiovisual exhibition contains six screens surrounding the audience, along with multi-channel speakers built with the help of a local digital media studio and the Center for Art And Media in Karlsruhe. Housed in the 19th-century structure of Martin-Gropius-Bau, the month-long series featured installations and performances from Brian Eno, Thom Yorke, Holly Herndon and Mathew Dryhurst. Friday night's performances showed Peter Van Hoesen teaming up with Amsterdam-based visual artist Heleen Blanken and the Peruvian artist CAO working with 3D animator Michael Tan. Van Hoesen began with a 40-minute set of slow ambient sounds on a modular synth, accompanied by Blanken's video art, which focusses on natural material such as water and microscopic zoomed-in footage of organisms, including images of her own bloodstream. One highlight of the set included drone video shots of a forrest in the mountains of Slovenia in negative processing, combined with Van Hoesen's drone sounds from the modular synth. The music's intensity increased as Blanken's footage switched to images of the stars, recreating the sensation of looking up into the night sky. My friends and I were worried we'd get uncomfortable sitting on the floor in the middle of Gropius-Bau's exhibition hall, but a perfectly timed intermission between sets allowed the crowd to ease into the next show. Ahead of CAO and Michael Tan's performance we were encouraged to stand, which was the right move for the madness about to ensue. CAO's artist name takes inspiration from an ancient priestess whose heavily tattooed, mummified body was discovered near the coast of her native Peru. Her haunting performance could just as well have been telling the story of the world the Lady Of Cao inhabited. Tan's 3D images of volcanoes, rock formations and fictional ancient artifacts twirled around the screens as CAO twisted her industrial electronic sounds into tortured folk and techno-tribalism. Sampling her own voice into witchy screams and psychedelic chants, she left the audience spellbound. Reflecting on the show outside the venue, I was particularly impressed by the curation of the night. Grouping Van Hoesen and Blanken with CAO and Tan defied traditional artistic dichotomies of organic vs. artificial, or analogue vs. digital. Though the pairs worked with contrasting methods, their art shared a curiosity for the otherworldly and overarching themes of space and time.